WARNING – LOCAL CONTENT! Hamilton is experiencing a cultural growth led by an organic happening called the Art Crawl. With organics, we have seeds. I would like to honor the seeds I have seen and sewn in the growth of our culture. Education is often at the root of culture and that in-part was my introduction into the arts – through the scene at McMaster University. Despite being an Engineer, I hung out in the Art’s cafeteria so partied with artists, hung out with musicians, etc. I made art, made music, put on shows, etc. during the 80s. Hey, and did the same during the 90s – oh… and the 2000s and here we are in the 10s and we are still going. Before me… I am sure there were scenes. I like scenes – I nurture scenes and do my utmost to promote and welcome people. Perhaps, that is my lot in life. I have always liked a good game, a good party, a social happening – unabashedly meeting people and introducing people – breaking down inhibitions. So, let’s check out some of these events. As much as possible, I will relate these to the James Street area and in each case, we should remember these as seeds and their organizers as planters, their attendees as pollinators, etc. I hosted some dances in the 80s during my Goth phase – then called Bat Caver. There was a guy called AD who also hosted an event called Nekropolis and that happened on King William, where later in 1994, Thee Gnostics were the house act at Hep Mondays at the X-Club run by Darren (but I have skipped ahead). After university, in 1986, I went to Europe for 9 months – another way to grow is to travel, and then we spread culture. I came back and brought back with me a mod / psychedelic outlook and started doing dances called Op Hops. One of these was at Patsy’s Banquet Hall on James in 1988. Somewhen around that time, there was a band called All Together Morris whose lead singer Glen Marshall had a studio space on James along side Denise Lisson’s gallery studio across from Jackson Square – so the first scene I recall on James St. However, one of my earliest Hamilton cool memories from the seventies was of the record shop on the corner of James and King upstairs – might have to ask Bob Bryden about that. There was also Susan George over in the warehouses by Beasley and various cool warehouse art parties. The Hamilton Artists Inc was located on James Street the seventies across from where Mixed Media is now and then on James by the Wild Orchid where RoseAnne worked and then on Vine and then over above Gallery on the Bay and then on Colbourne near where the Art Bar is currently just off of James and now in its fantastic new location at James and Cannon. We solute the board members and volunteers of this scene – Paul, Judy, RoseAnne, Ian, Donna, Michael, Philip, Tor, Ivan, Douglas, and many more. We were in at the Vine location before the Artists Inc. with a really cool art beatnik hang-out with Gaven, Stavros, Lorraine, RoseAnne and the Chessmen played there at my Stag. Earlier, Tomas, Lorraine, Walter and Zena had the Synagog on Cannon with their band, Sublimatus. Gaven and I put on the Figmentalisticanarianismist show there in 1991. Around the same time, I had a piece in a large group show at the Liuna Station on James – kind of. Many artists around. During Thee Gnostics time, the cool kids were hanging around Hess Village and we played the village a number of times. But the cooler kids were starting to think elsewhere and look for a new music / art scene. We went to Barton and Thee Gnostics had a great flat above an old post office as head quarters. Tomas, Gaven and Lorraine lived there and I hung out there almost daily and of course, there was James and Cosmic Ray. We connected with Elis and Dennis – who hung out with Francis. They started the Gallery 435 speak easy hang out and it is still going waiting for the artists to finally come to Barton when the rent gets too high on James. We were looking for a place for a scene and visited the Westinghouse building in hopes for it to become the new Rochdale. As Thee Gnostics we also played on James at Bauka‘s studio – can’t remember quite where that was – it was on a South East corner maybe James and Rebecca possibly York or Cannon. As well as excellent warehouses – Johny Angel on John for the Egypt Vishnurama. John and Jesse had a cool little place on Hughson I think and King William. The Double Feature Creatures were hanging around – Christine Leakey, RoseMary, Julia. Art parties at the greenpeace houses – Chris – the old Jewelry place on York, etc. And as mentioned, the Hep Mondays at the X-Club on King William right on the pre edge of the happening alternative club scene with Home Grown, Absinth and Baltimore House. That building will be amazing if it ever opens again. 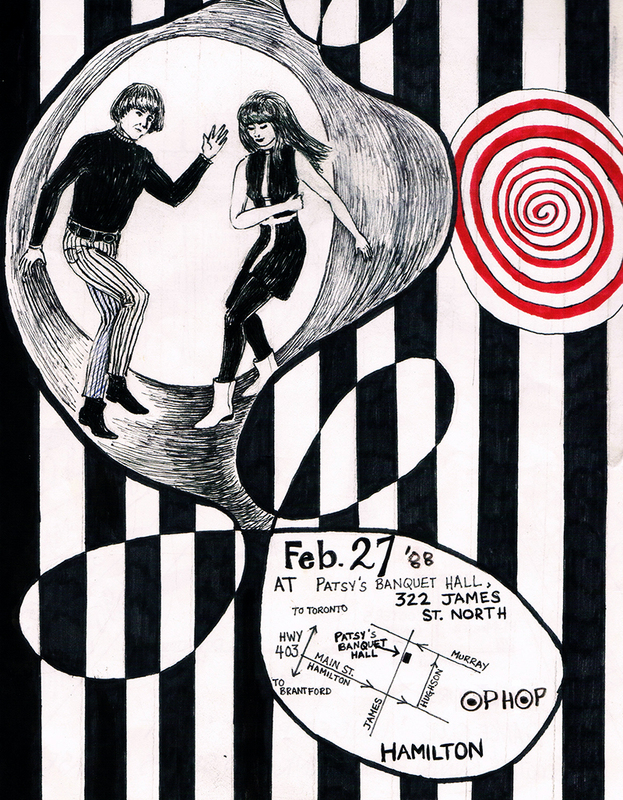 There was Psonic Unyon too on York and we did dances in that building with the mods – Samantha, Andrea, Valerie, Erin, Andre, Gaven, Sandy and shows at this amazing Chinese Playhouse upstairs on James around Rebecca – amazing place that and totally underutilized in our current environment. Oh, and how could I forget – the Tivoli – before the front was taken down – the auditorium is still there. 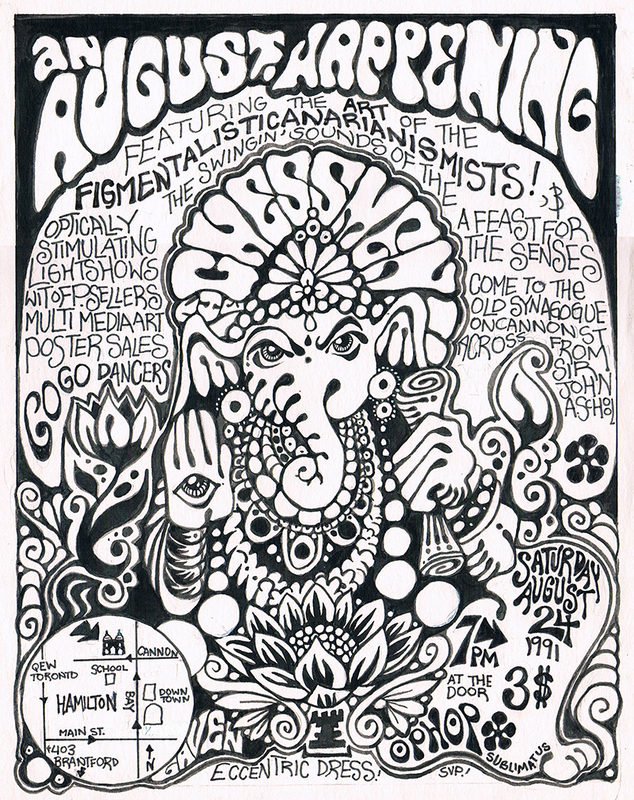 Thee Gnostics played there watched by Chris, Lilly, Lisa – and others. When Barton took too long we actively were establishing a scene on John Street. John and Andrea Deal started the GAG Gallery in the space where previously, Mark Byk, Peter and Kristine lived and where we beatnik-partied like crazy! Later at the GAG we held the first Interactive Interactive show in 2003. We also held the No Escape Artathon where we locked artists up in the gallery for 48 hours. I MC’d that event to live web casting. I met Steve Mazza, Laura Hollick, Len Jessome, all who have gone on to great artistic heights in Hamilton. Many others too – Martin, Matt, etc. Bob has some pictures from around that time – would be great to see them. I planned to stage an Art theft to get people in the Suburbs to pay attention to arts in the city. I ran Interactive Interactive shows with Sheridan and McMaster Interactive Media at the Artist Inc for the next four years 2004, 2005, 2006 with the last one in 2007. It was just too hard to get media and people from the suburbs to come plus we started doing open houses in Toronto and packing everything twice at the end of the year was too hard. Here is a shot of James Street in 2007 with Mixed Media and the Factory at their old locations and Dane’s Loose Cannon where I usually purchased something each visit. I was at the first meet to discuss the Factory – it was held in the Artists Inc above Gallery on the Bay. And I certainly remember Mixed Media in their old place with Dave and Teresa – I donated a cool 50s boomerang chair and Ottoman. During the mid 2000’s I also MC’d a number of Artists Inc events with Sky Gilbert and Matt Jelly like the Sin Circus at Worker’s Heritage building where Brian Kelly works and prior to that there were the Fetish Fashion Shows with Sue Phipps and Ian James the last of which took place somewhere on James – was it the Chinese Playhouse (not really called a playhouse – would love to find that again!). Well… that’s enough name and place dropping for now – doubt anyone gets this far but good memories and really would like to honor all the folks that have made Hamilton so much fun. Keep at it – would like to tell the story of early Art Crawls but will leave that for another post. I am just glad a self sustaining art scene has finally arrived so we don’t have to work as hard! Our garden is growing – Gardener Russ would be happy – hi Russ! — 15 — PP – Please forgive me if I left anyone out – or even give me a comment! This was all from the top of my head so I may have mixed some details. Again, it is how I remember the past as it relates to James Street N and Art – there was certainly much more going on all over – art on James S, Kevin McKay‘s early SkyDragon scene, music scene at the Corktown, Dundas art scenes, etc. but I tried to focus on perhaps some forgotten seeds leading to our current wonderful scene on James. Dan Zen on Consumption and Creation. ZIM is “Better than Nothing” ?? Tired of the same old Medallion? Try Hangy! Dan Yen over One Billion Deck Dollars in RichDeck!